Hey all, I am up with a card, this was made a long time back, and I was just holding on it to post. I used shades of blue water color , and some brown on the center , and then took a plastic clear wrap, and placed on the card, and moved the wet paint around, at the top I moved around, so that it looks like clouds. I moved my fingers up and down for the brown to mimic the look of some plants , and refection, and the bottom one is moved so that it looks like moving water. 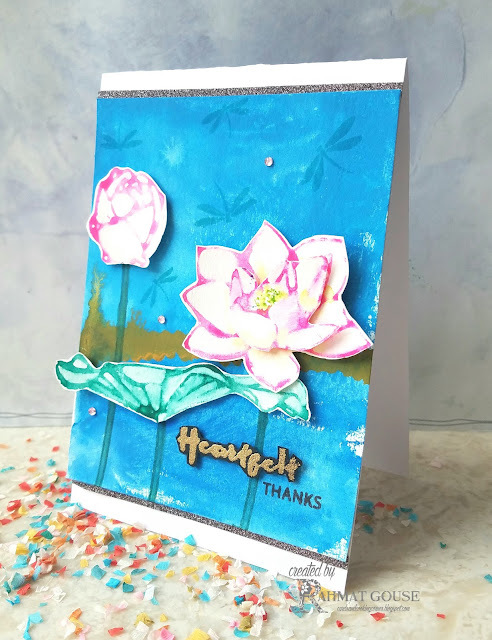 The lotuses are from Waffle Flower, and water colored those using zigs, and fussy cut to add to the front. Stamped the dragonflies in blue to gel with the background. Sentiment is from same set, a part of it is heat embossed and fussy cut. I added some grey glitter paper to the panel, and added to the card. Isn't it wonderful that our minds, and hearts are in sync, Rahmat? I used a different company's stamp, but the same bloom for The Flower Challenge! Wish we lived side-by-side! Oh think of the cooking/card making? Can I join in too xxxx ? You know the feeling in an underwater aquarium - you're surrounded by all blue and wonderful aquatic life - that's the feeling I get from this card...though the fish are replaced by dragonflies! :P Its really beautiful!! loving that background! Thank you for taking the time to join in with us over at The Pencil Case.